Volets Rouge is a wonderful place to stay. Really off the beaten track, very peaceful and relaxing. Mark and Judy are wonderful hosts - nothing is too much trouble. We appreciated being able to use their bikes for a cycle ride in the surrounding countryside which is beautiful. We also enjoyed relaxing by the pool. We went along with son, daughter-in-law and two young grandsons. The accommodation was fantastic and very comfortable. The pool was excellent and we had close on sole use of it, much to the boys' delight. Mark and Judy are ideal hosts; ensuring we had everything we needed without being over intrusive. Mark's wine tasting was well chosen and displayed great local knowledge. A fantastic holiday which we look to repeat. Had a brilliant break here, everything was well maintained and the property was stunning with everything you needed provided. Judy and Mark could not have been more helpful but not intrusive in anyway. The pool was stunning and if you wanted to eat outside a bbq was provided. The local shop was only 1.5 miles away and had a great selection of produce. We have just had a super holiday at this gite and Mark and Judy couldn't have been more helpful. There were 6 of us (3 couples) with one of the group in a wheelchair and the cottage is well laid out. The owners organised a trip to a local vineyard for us and made countless phone calls enquiring about disabled facilities at restaurants / attractions which made life so much easier for us; they even organised our final vet trip for our dog - if anyone else uses this local vet, they only charged 25 euros! 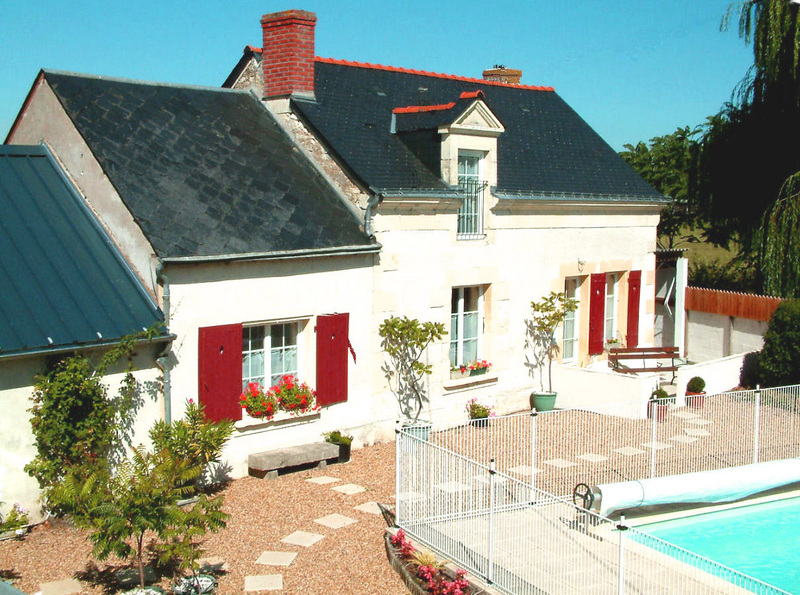 I would definitely recommend this gite - ideal for families who want a restful holiday. We came upon the Volets Rouges by chance, whilst doing a motoring tour of the Loire. It turned out to be a very good find. Friendly and helpful owners, Mark, Judy and family, have created a delightful and peaceful haven. It has very good facilities, that include a pool, plus all that we needed to make for a relaxing vacation. We booked for 3 nights and enjoyed it so much that we stayed for 6,. Allowing us to take advantage of glorious weather, and the many attractions nearby. We were a small group of friends on a weeks break - on motorcycles; after a long day riding to Les Volets Rouges from Roscoff (via a friend house) we arrived to a very warm welcome from Mark & Judy, we were shown where we were staying and the garage Mark had cleared out for our bikes to be parked in - which was great as the weather was a bit damp. 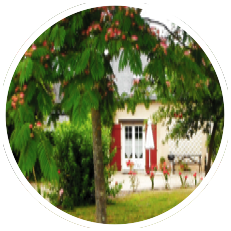 The gite was fantastic my wife and I had the ground floor bedroom which was big with a double bed and had a large wet room just off it, the two Twin bedroom upstairs were a good size with on-suite's. We had a large fully fitted kitchen and sitting room with a TV with British channels available. The whole week was very comfortable, there was lots of information of what to see and where to go in the area, Mark and Judy sorted of a wine tasting and even helped with our shopping and ordering some food to be delivered the following night. Emma their daughter even helped one of our group at the doctors when he was taken ill.
"All in this is a fantastic place to stay"
All in this is a fantastic place to stay the Gite(s) are very comfortable as a base to do day visits (You can get to all of the Loire Valley attractions from here) or just to stay and relax in or outside in the garden area (there is a very large play area for children). This was my third stay at Les Volets Rouges and each time I have experienced the incredibly warm generosity provided by Mark and Judy. One stay was in La Forge with my partner, the second with my mum, sister and daughter and this final time with my fellow motorcycling friends who stayed in La Grange. You might think that a chilly October half term on bikes is doomed from the start but nothing was further from the truth. After a brisk blast from Roscoff we arrived to a fabulously clean and well-appointed gite and complimentary wine, bread and milk. After 300 miles riding, no one felt inclined to venture to the supermarket for supplies so Judy offered to drive us there and bring the necessary bottles of water, wine and beer back in the car. What a diamond. This thoughtfulness continued all week when the following day, all 7 of us joined the family for drinks and later in the week prevailed upon their daughter Emma to act as interpreter when one of our party needed a doctor's appointment and was later blue-lighted to Saumur hospital. I cannot praise this holiday destination highly enough and look forward to my next visit very soon. We thought this accommodation was superb. It was fitted out well and fully equipped. The location is perfect as a base for Loire Valley exploring. Having English speaking, friendly but not imposing, hosts was a massive advantage to us. It is very child friendly and safe with lots of onsite entertainment for them. If the Loire wasn't so inviting, we could have just spent a week onsite! The online photos don't really do it justice. This is one of those rare properties that I believe looks better in the flesh. We loved La Grange! There were four of us, two adults and two young children. My wife and I appreciated the space, well-appointed kitchen and showers (there is also a bath). The children loved the table football, the swimming pool and the cosy bedroom in the eaves! You get the sun streaming in at both ends of the day and there is a patio with a picnic table overlooking a large garden (living in London, I'd say shockingly large!) which has some swings, a slide, a climbing frame and den which pleased our girls. All in all, a lovely base to explore this end of the Loire valley and, as a bonus, Judy and Mark are welcoming and friendly hosts. Only small word of warning is that WiFi connection in the gite is hit and miss, best connection is outside but given some sunshine that's not a real issue. We'd definitely recommend La Grange. Excellent quality house with great rural views, and high quality furnishing and kitchen equipment. 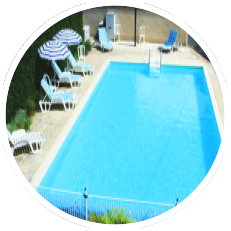 Friendly and welcoming owner, very good swimming pool with excellent quality water, perfect for children. My grandchildren loved the Game Room. A superb location with the culture and classic French delights of wine and cheeses readily available. 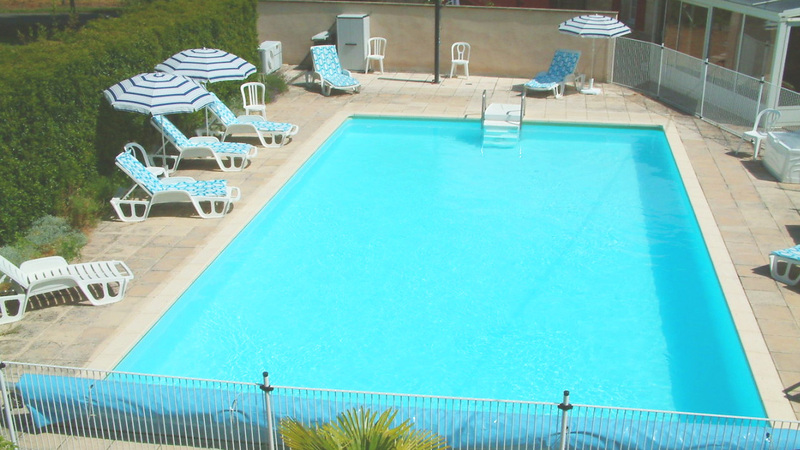 Nice and quiet plus peaceful to rest and enjoy the immaculate accommodation including a large spotless swimming pool. This is family run and the care and attention to detail clearly shows ensuring your stay is perfect. You can be assured of a genuine friendly welcome from a really nice family with local knowledge. 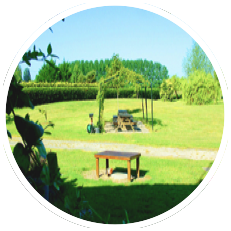 The garden is secure and the Gite private so you can relax and enjoy your surroundings. This has to be the benchmark others aim to achieve. The owners of the gite were very friendly and helpful. The booking process and general information was prompt and efficient. 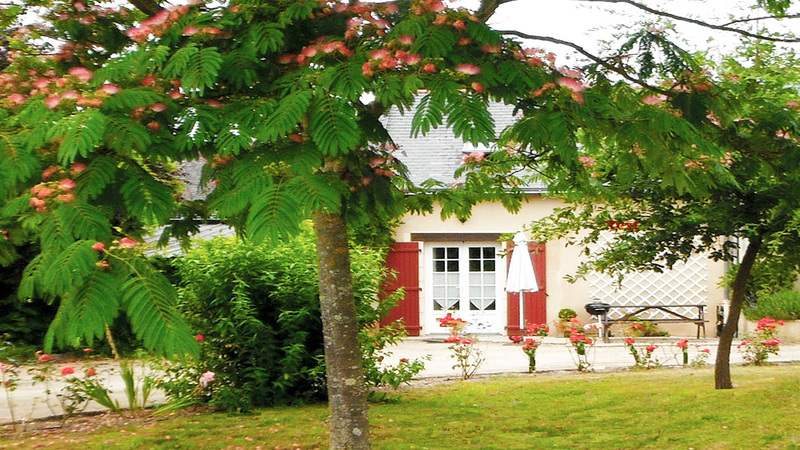 The well-equipped gite itself was in a pleasant, calm setting and provided plenty of space for 5 adults. 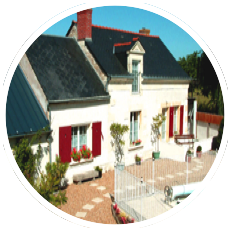 The location in the Loire, close to Saumur was excellent and for nearby day to day needs Allonnes provides enough individual shops and a supermarket. It is a reasonable distance to drive to many of the chateaux and other interesting towns and attractions. As we were there in a cool, rather wet week we were looking for places to visit that provided a certain amount of cover and shelter from the weather. This we managed to find without having to travel too far. The two youngest members of our group spent a day in Angers, catching the train from Saumur. They were able to explore the town and managed to find a nice restaurant for lunch to celebrate their wedding anniversary. What a lovely place to stay and the accommodation first class. Judy and Mark were great hosts and very helpful. So relaxing and enjoyable, just what we all needed. Near to many interesting towns etc so good location too. We stayed at La Grange during August for a week; myself, my husband and two children. This was our third visit to Volets Rouges and we will be back again, no doubt. Mark and Judy and their family are incredibly good hosts, very welcoming and friendly. They host welcome drinks to introduce everyone and a wine tasting session at a local vineyard during the week. The family also have a very friendly dog who my children fell in love with and were allowed to walk every day! The accommodation is really good, very clean, well equipped and tastefully decorated. We were extremely comfortable during our stay. 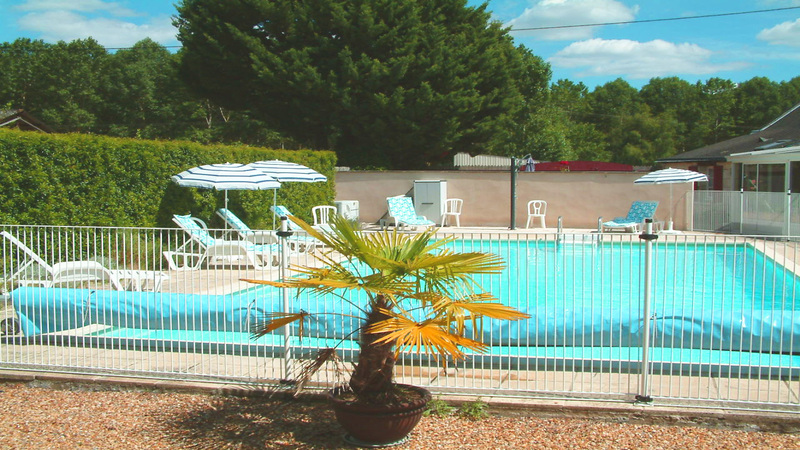 The pool area is safe for children and large considering the number of gites. We spent a lot of time around the pool its lovely and clean and generally quite warm. Judy even supplies pool towels which saves a lot of space in the suitcase. The area has lots to offer, we took bikes as it's really flat and Saumaur is easily accessible by bike. There are lots of local restaurants and Mark and Judy are very helpful with bike routes and recommended places to eat and visit. Overall we would recommend this holiday to anyone really, no complaints at all!